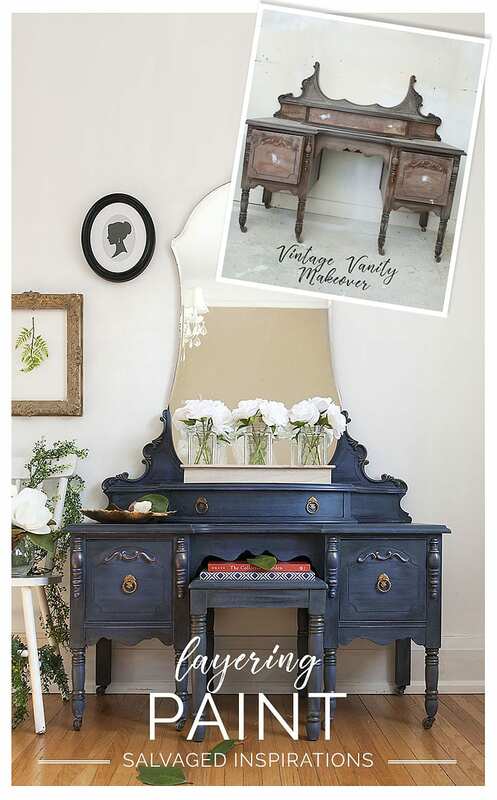 I’d like to say this layered ‘Stormy Seas’ Vintage Vanity was my plan all along, but the truth is, this makeover took some unexpected turns. My original plan was to layer some pinks and then white wax for a soft romantic look but it turned out quite the opposite with this deep stormy seas layered finish. THIS POST IS SPONSORED & CONTAINS AFFILIATE LINKS TO PRODUCTS I USE. YOU CAN SEE MY FULL DISCLOSURE HERE. You guys left some comments on the last layered chalk paint post saying it was helpful to see how each layer looked while painting, so I’ve gone ahead and included step by step pics here too. They’re proof, sometimes you just have to go with the flow and see where it takes you! I started by cleaning the piece with a 50/50 mixture of Dawn and vinegar which I keep in a spray bottle. Aside from cleaning furniture, this mixture works really great for household cleaning, sinks, tubs etc! I gave the rest of the dresser a light sanding with 180 grit and then wiped away all the dust with a tack cloth. 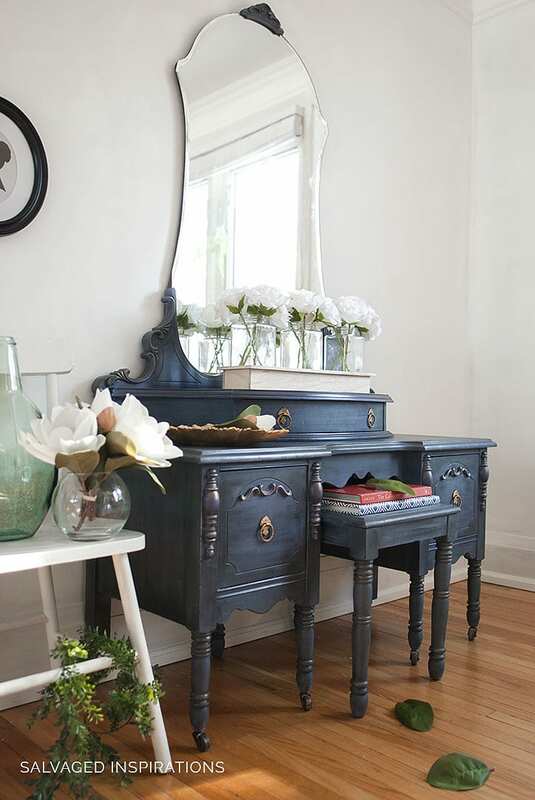 Seeing as it’s the month of love and I wanted to join in on all the Valentine’s fun, I envisioned this vintage vanity to be soft and romantic. Very feminine. I had a pink-tinted Kilz Max Stain Primer which I picked up at my local ReStore for $15. This was a perfect start to block any bleedthrough (which often happens after sanding these types of vintage pieces) and lay down my pink base all in one step. Who doesn’t like a shortcut, right?! 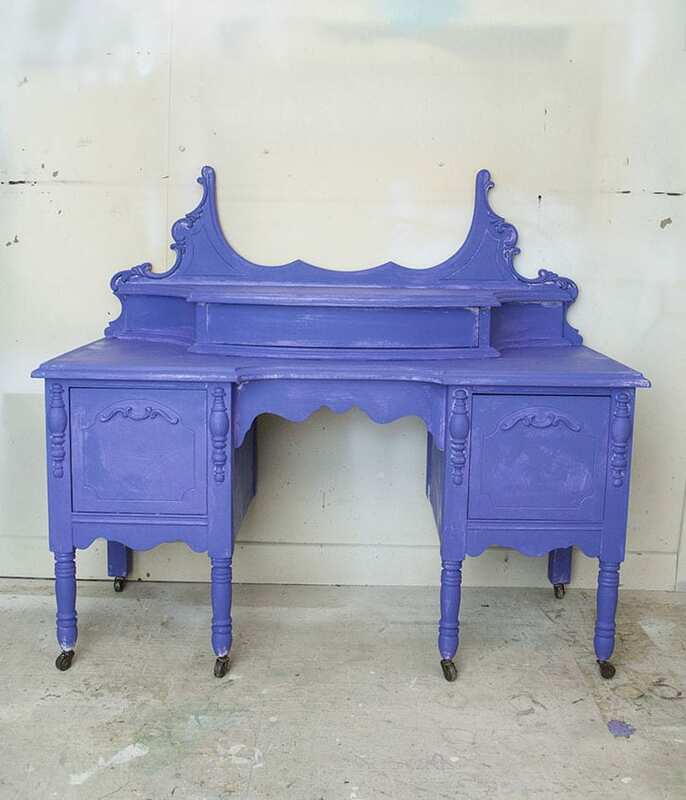 To add an interesting layer to the pink, I mixed purple (did you know ultra Violet is Pantone’s Color of the Year!?) and cream to make a complimentary color. I should have measured but I think it was about a 2:1 ratio with Amethyst being the dominant color. 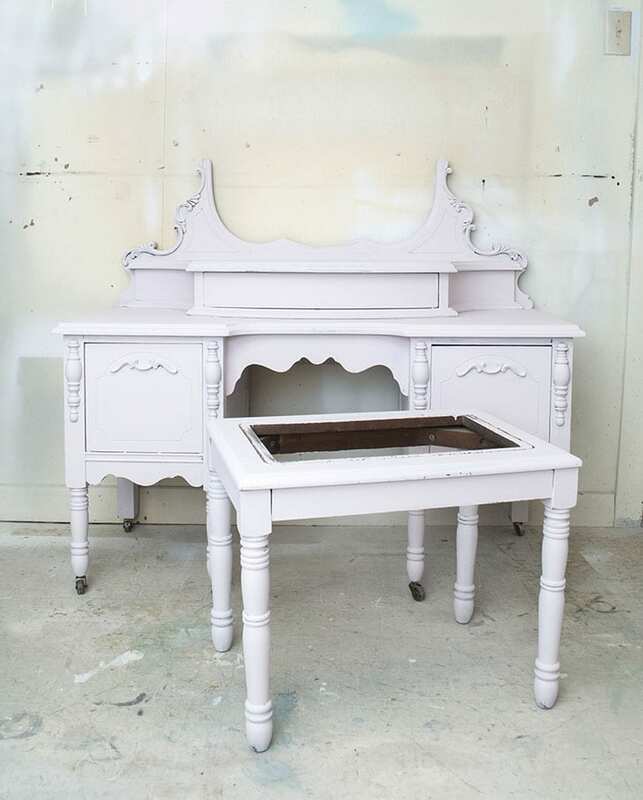 When I painted this mix onto the pink, WOWZA… not what I was expecting! But I was a trooper and kept painting. Heavy in some areas, light and feathery in others while I thought of a plan B.
I picked Stormy Seas to layer over and tone down the purple. I applied the paint heavy in some areas, light in others and then sprayed a little water in places so the paint became a wash. This let the color underneath peek through. It gives it a soft subtle look with a lot of depth. You can see from the pic below where I sprayed water. 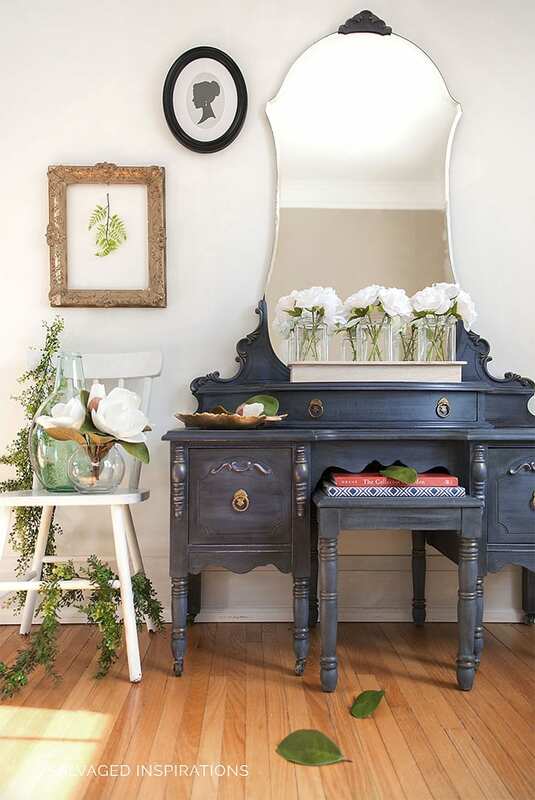 The drawers, the trim, and both sides where the mirror sits have only a light layer or wash of Stormy Seas. You can see a hint of purple showing through. I’m not sure if black wax can be considered an actual color, but for all the difference it makes to a piece, it might as well be. In the pic below you can see the piece has been sanded and distressed in a few areas (that’s why the paint looks lighter!) and the top drawer and mirror cradle have been black waxed. I applied the wax heavy around the sides and dry brushed into the middle. You can see more of this dry brushed waxing technique here and here. 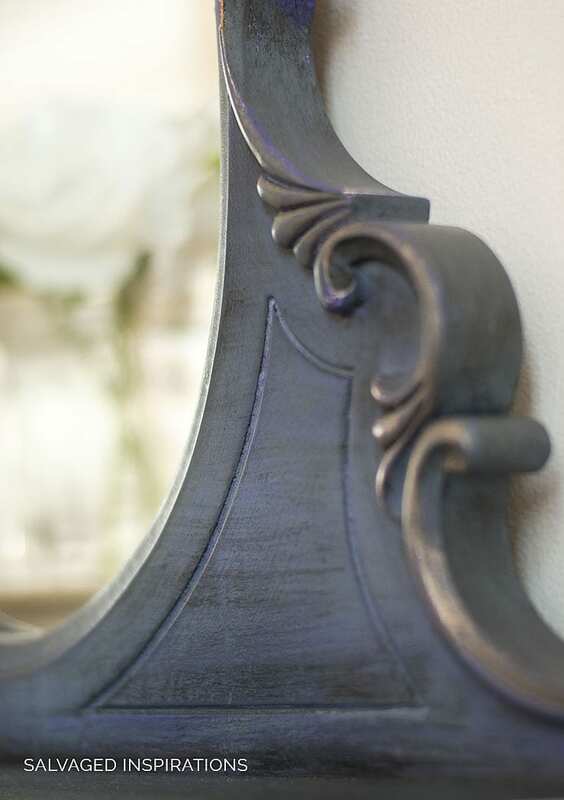 To add more interest, I applied a small amount of this Gilding Wax to highlight the details. The last little detail was the hardware. 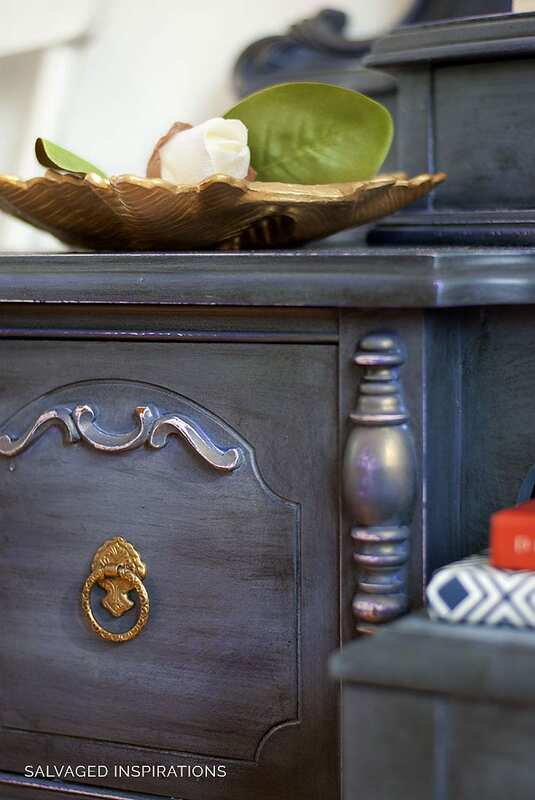 The original brass knobs were missing a piece, so I salvaged vintage knobs from an old dresser. 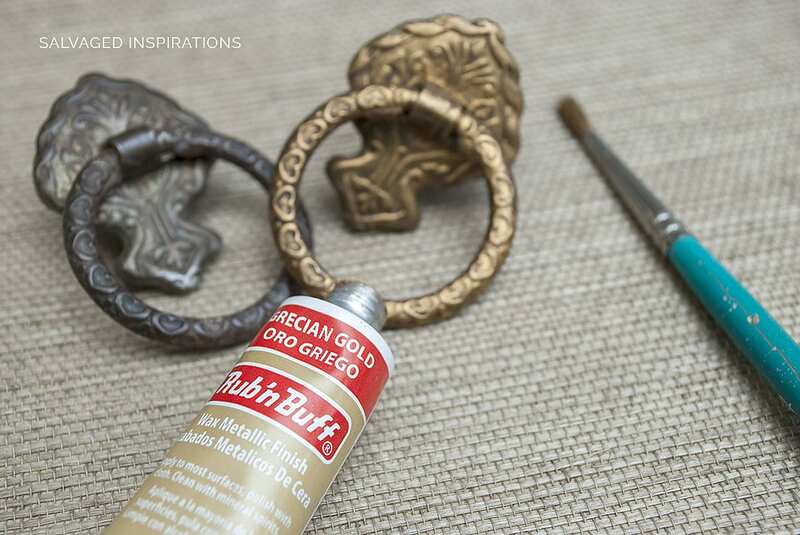 They were brightened up with Grecian Gold Rub’nBuff. And here’s the finished piece. It doesn’t look anything like I was originally planning, but it’s stunning! I’m really happy with how it all turned out! My takeaway from this piece – go with the flow. I know it sounds a bit woo-woo-wee, but sometimes the furniture will ‘talk’ to you and steer you in its own direction. And what you think is a mistake just might be the way to an unexpected beautiful finish! I’D LOVE TO HEAR IF YOU’VE EVER LAYERED BEFORE? 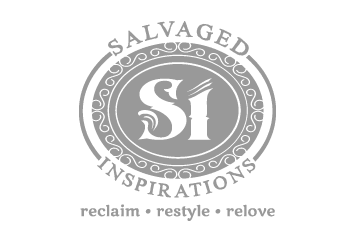 IF YOU HAVE ANY LAYERING TIPS YOU’D LIKE SHARE OR HAVE ANY QUESTIONS, FEEL FREE TO CHIME IN… I ALWAYS LOVE HEARING FROM YOU! Thanks and have an inspiring day my friends! Denise, i absolutely love this color and how you “rolled” with it and make it look so pretty. Did you use clear wax before the black wax? I really need to get with it and find pieces worth painting. You are my favorite furniture artist. I just want you to know that. Hello Denise! This turned out fantastic. 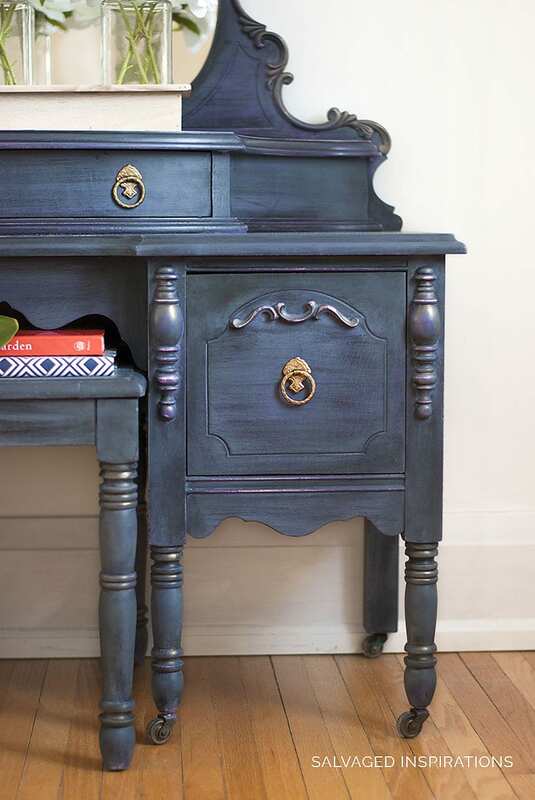 In fact, something between this and your empire dresser makeover is what my ideal finish would be… Any tips how to get something like that? Also, is there an alternative to the black wax? I love the look it gives, but would prefer to not use wax if possible… Can’t figure out if there is another way! Wow — one of the most stunning pieces I’ve seen! The black wax is amazing. I rarely comment, but this is really amazing! I am so glad I found you–all quite by accident (or Divine appointment???). I have been perusing your page for two hours now and fall in love with every.single.piece! Then, I found this beauty. Oh my goodness! I have no words to describe the delight this gorgeous piece brings me. I truly think this is one of the most amazing pieces I have ever seen. Thank you for your detailed explanation of how you reached the rich results. I am now an SI follower. This has to be one of the most stunning pieces I’ve ever seen & have 10’s of thousands restorations pinned! Thank you for sharing your experience is such a concise and easy approach, for even aspiring newbies like me can understand. So grateful for your generousity of sharing so many of your tips & tricks, which spawn so many inspiring projects around the world. Wow! !” This looks like it belongs in a museum. Simply gorgeous! This is gorgeous! I am speechless. Denise…BREATHTAKINGLY GORGEOUS! I am actually looking for this exact color and when I came across the pic I was intrigued. I found your blog through another blog. 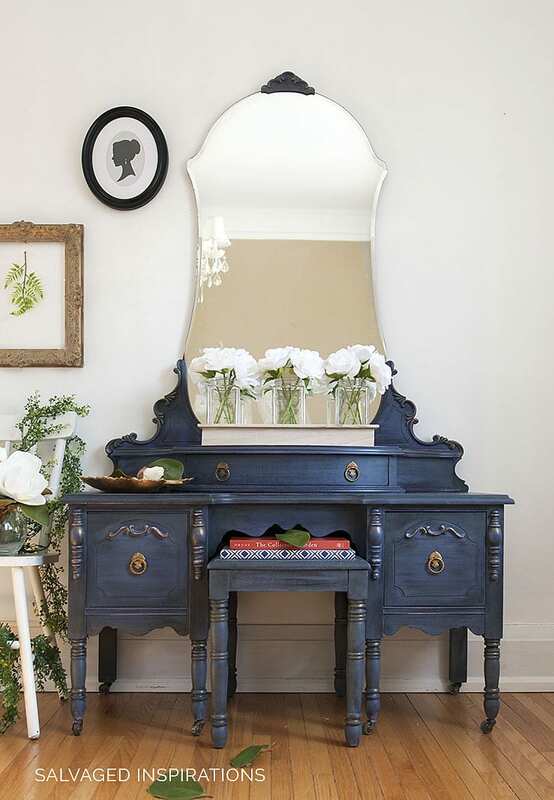 I would like to know for a piece this size, how much of the Dixie Belle paint you would use. Do you buy the 8 oz. , 16 oz. or ?? If you buy yours in large quantities about how much of each color would you say was used on this piece? 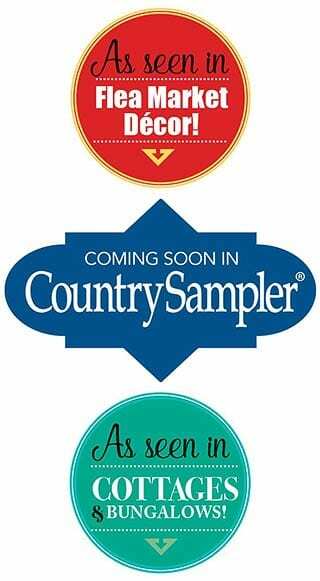 A cup of each, 2 cups of each..etc.? Thank you for sharing this beautiful technique! This piece is BEAUTIFUL!! Can you tell me why you chose gilding wax for the highlights instead of rub and buff on those areas? I am getting ready to start a large piece and thought I may use the rub and buff to highlight some areas. That is beautiful But can you please tell me how you apply your black wax without it sucking right into the wood and being unmoveable?. I always apply a clear top coat of somesort so the wax will slide around easier.. Would like to eliminate this step. That is absolutely gorgeous! I love when plans go awry but end up turning out lovely in the end. Yes, I’ve been doing layer pieces. My favorite so far was a little vanity I did for my granddaughter. I did ombre: navy to turquoise to mint green.. l splashed hot pink on the turquoise and coral on the mint green. I used watere down craft paint and applied it with a makeup blush brush because they are so soft. Then gave it a little mist of water. I can’t wait to do more. Two words – just beautiful! Wow, I have been avoiding wax as it never seems to work for me, but you have inspired me to try again! Thank you. 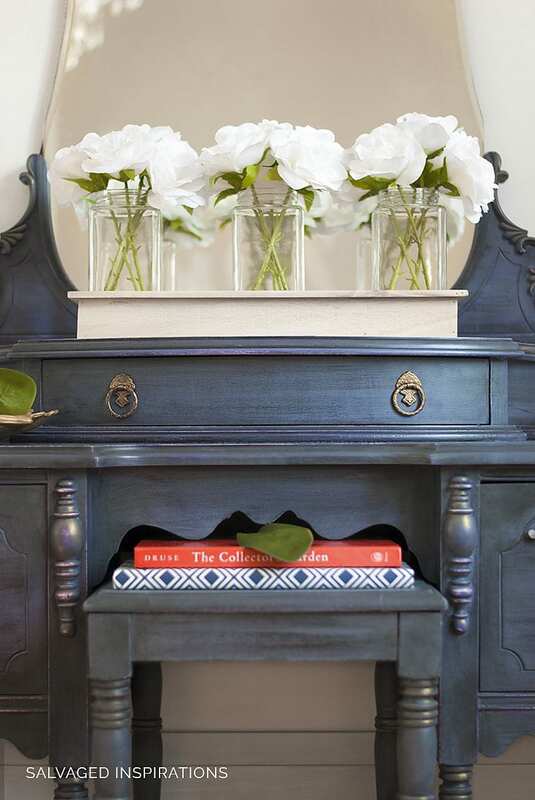 The blue is so unexpected and makes a BIG statement in the room. The step by step instructions are beyond helpful. One more masterpiece, Denise. Thank you for sharing your gift with all of us! Absolutely gorgeous! The tones and depth of color you achieved are just beautiful. Definitely one of my favorites – though I love everything you do! Thanks for all the details about the journey. It was definitely worth all the unexpected turns! WOW…I am impressed!!! I used to refinish a LOT of furniture years ago, but my projects were mostly stripping and staining. How on earth do you ever decide what colors to use together. Anyway, it’s beautiful!!! Wow!!! This turned out beautiful! 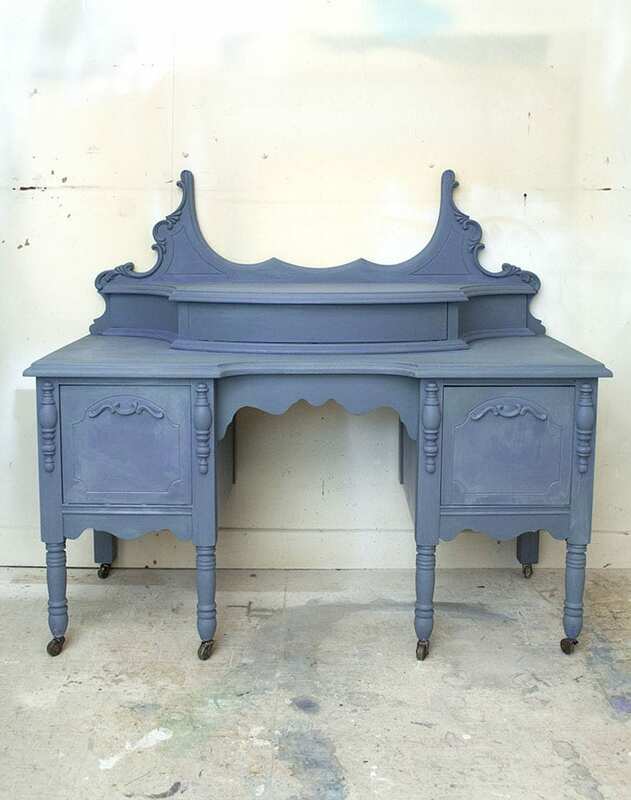 I love refinishing furniture and this gives me another idea of layering different colours. Thanks for your picture tutorial. This is so beautiful and inspiring to me! 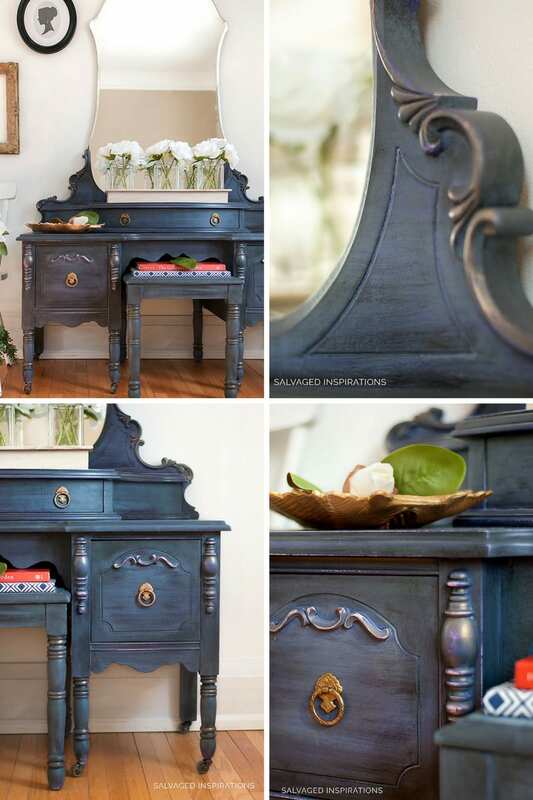 I have been planning a project of 2 dressers in a layered paint method, and these steps are so helpful. As always…… beautiful! Love your work! Pinning for sure! It’s gorgeous Denise! I think it would have looked very pretty in pink but it turned out stunning in ‘stormy seas’. So glad you like it Teresa! Thank you!!! Wow, it really did steer in a different direction, Denise. Beautiful layers but the black wax made those layers so rich and the gold highlights are such a stunning touch! 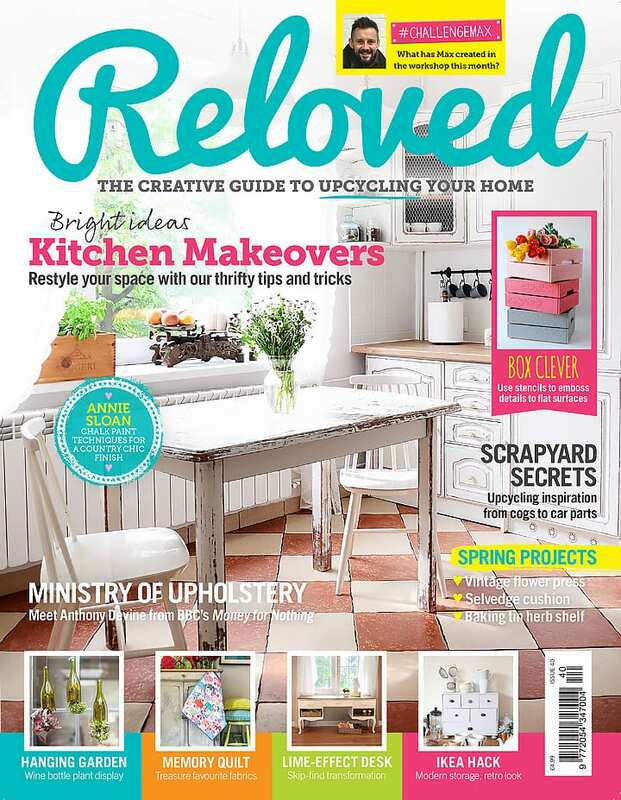 Beautiful makeover – pinned. Wow…just gorgeous! 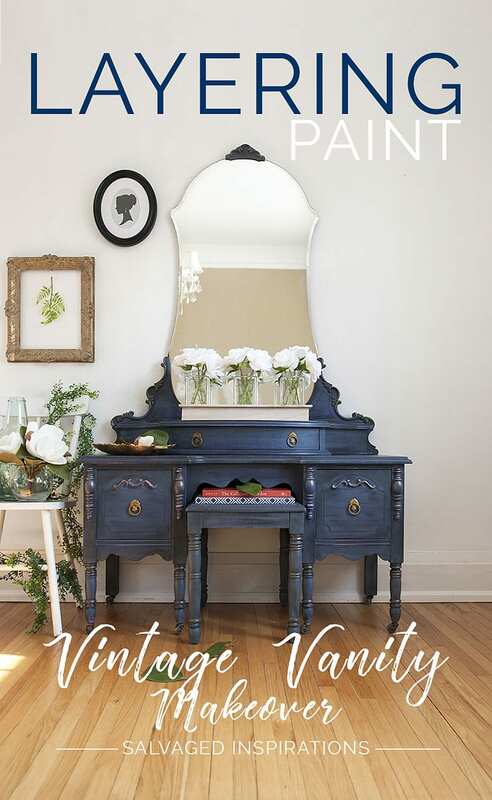 I’ve seen other pieces in Annie Sloan and love knowing that a better priced paint is out there. Thanks for the great tutorial and all the tips. Wowzer! Exquisite end result! Thank you for sharing the details on obtaining this layered look. Especially appreciate the pics showing bare painted amethyst color & how sanding it changes the color first, before adding anything further. Great tutorial. Another STUNNER Denise!! I just LOVE your work!! Wow that’s amazing … Unfortunately I cannot purchase the paints etc as I live in the uk …. , wish they had a site over here. Hi Denise! What a gorgeous color you ended up with on the piece! I love the tones you pick for your painting projects! I also have a question for you. What is your secret to getting no drips? I am plagued with being as careful as I can and later discover I’ve got a semi dried drip of paint! 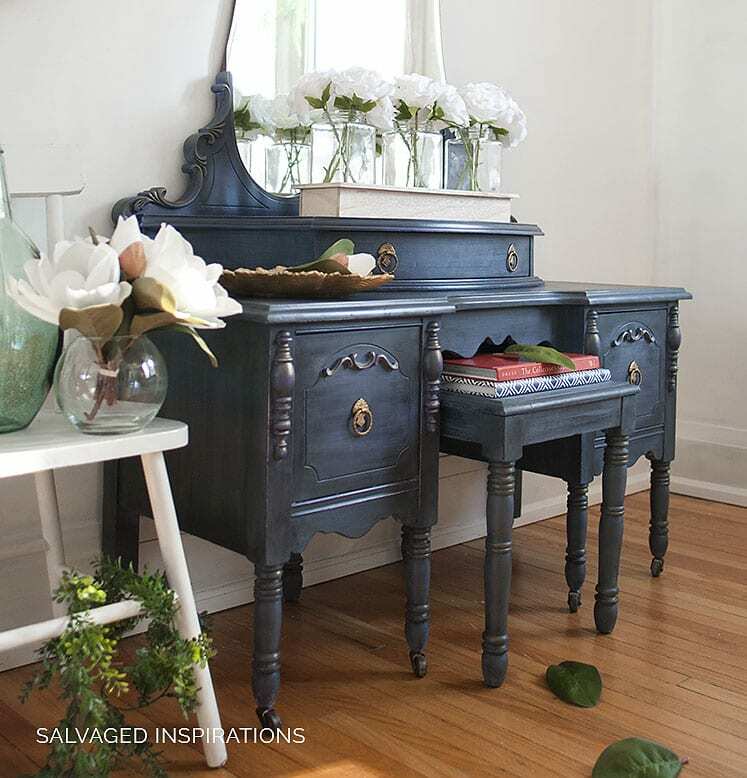 I’ve never used chalk paint, but. any other paint has been a problem for me. I’d love some advice. Thank you! OMG! So beautiful! I’m DB Kudzu green with envy! Beautiful! I am beginning my first “layered” piece and found the post so helpful. I will remember to “go with the flow” Thanks. 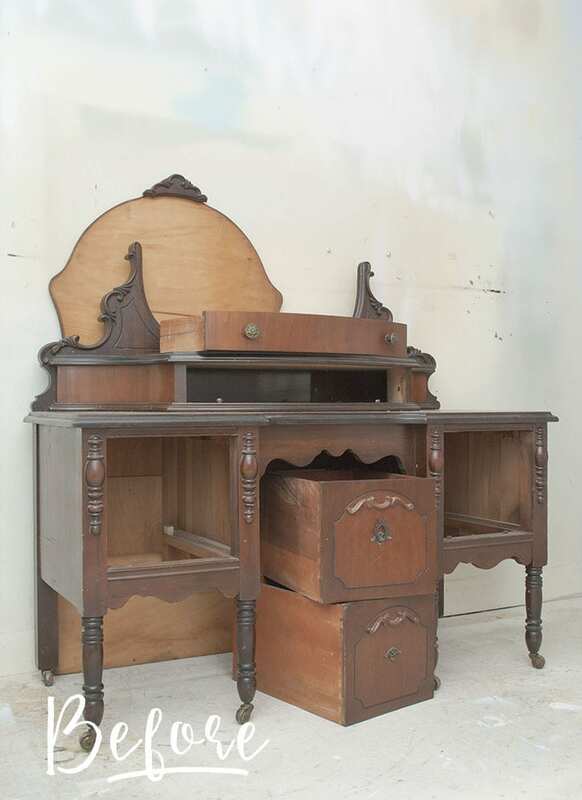 So FAR past a piece of furniture – this is a piece of ART. Stunning doesn’t come close to describing it. And I do not like blue anything except in jeans! WOW, just absolutely WOW!!! I am totally pinning. I was awestruck when the piece turned out totally different then the first layer. Ab.so.lutley stunning. I love it. Thank you for sharing the tutorial. That turned out really nice. A lot of steps. 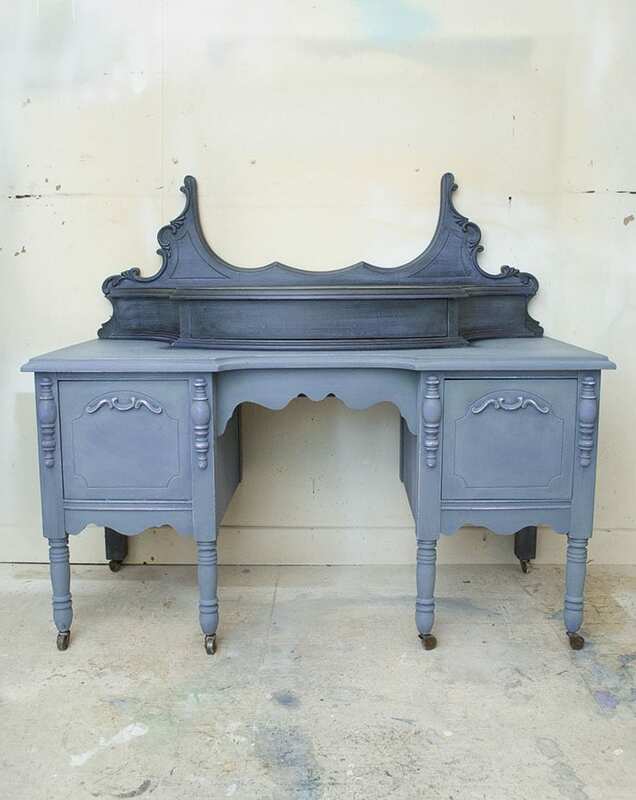 I chalk painted a a china hutch using two coats of paint and a layer of wax. I still find that iif I knock something against it (a dish I’m putting away) it goes straight through to the wood. Any suggestions? Hi Lorrie! It sounds like the paint did not adhere properly or maybe it’s not yet 100% dry/cured. I’m not sure if its a freshly refinished piece, but if so, you can wait to see if it cures up. 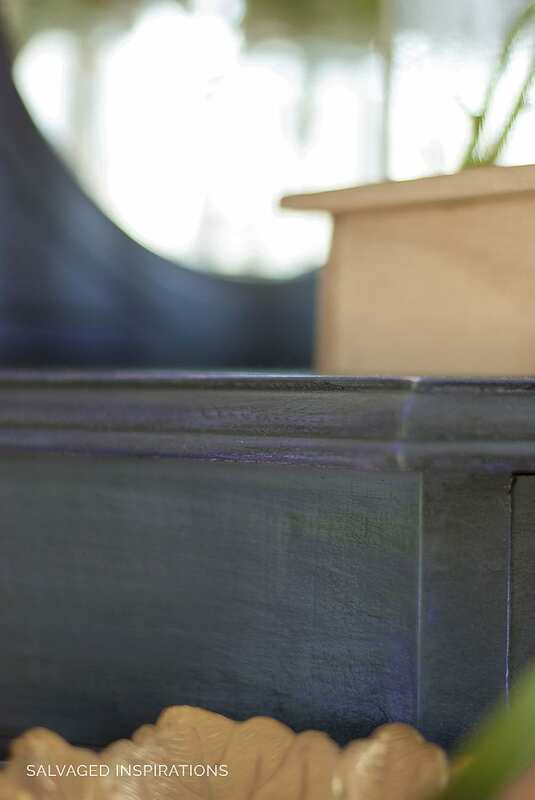 Otherwise, it may be that the cabinet would have benefited from a light sanding prior to applying the paint. Absolutely stunning! Thank you so much for the step by step instructions. I’m preparing to tackle a big piece with lots of layering and this is super helpful! Wow. Beautiful. I’m inspired to try the layering. This piece is absolutely stunning!!! Thanks for sharing your process, it really helps! Denise, it turned out beautiful! Thanks for the step by step tutorial on layering. I’ve been wanting to give this a try so thanks for the inspiration! I’m pinning this.